FastCover with our fabric buildings will be exhibiting at “The Big Event” Canadian Mining Expo, Timmins, Ontario on June 6th and 7th, 2018. The event will feature over 400 displays, on-site equipment demonstrations, exploration showcases, speaker forums, and jackleg drilling competitions. Outdoor and indoor showcases plus a career fair make this one event you won’t want to miss. FastCover has experience in providing storage facilities for the mining sector in the remotest of locations. Our fabric structures, prior to assembly are ideal candidates to be flown or ferried by plane, helicopter, or barge into remote locations. FastCover portable fabric buildings can then be erected on any relatively level site without the need for expensive foundations. FastCover’s fabric buildings can be secured to the ground in a variety of methods from screw anchors to rock brackets to concrete blocks. Whichever method best suits the location, the ground disturbance is minimal or non-existent. In the event the FastCover fabric building is no longer required at a specific location or site, they can be easily disassembled and re-erected elsewhere. Why a FastCover Portable Fabric Building? FastCover buildings provide protection against the elements for equipment, core samples and other important assets left on sites. Core samples are a vital asset to the current and future value of the site and need to be properly protected against the elements to minimize deterioration. FastCover portable fabric buildings keep trucks, trailers, heavy equipment and other assets out of the elements, allowing for faster and easier startups. No more shoveling snow, unthawing, or digging equipment out anymore! FastCover fabric buildings are the ultimate machine shed storage solution to protect hoses, tires and paint on industrial, mining, transportation and, heavy equipment from fading, cracking, and failing. This allows for longer life, less maintenance and better resale value of the equipment. FastCovers can be easily relocated to another location on your property to adapt to the growth and expansion of your business. 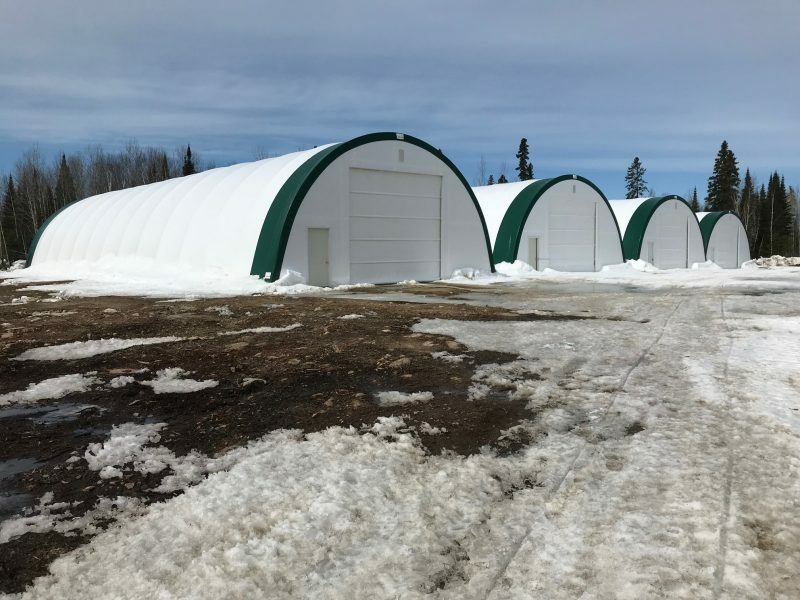 Find FastCover Fabric Structures at Pavilion- 03 at the Canadian Mining Expo in Timmins and browse through our inventory to see which fabric building is best for your needs.